I've been knitting a lot recently, or at least spent a lot of my free time knitting whilst catching up with a daunting backlog of podcasts. It's a welcome escape from outside events - Knitting leaves me just enough head space to listen to a civilised conversation about books and reading whilst I diligently count stitches and try not to go wrong, it's calming (until I realise I haven't been diligent enough) which is good. 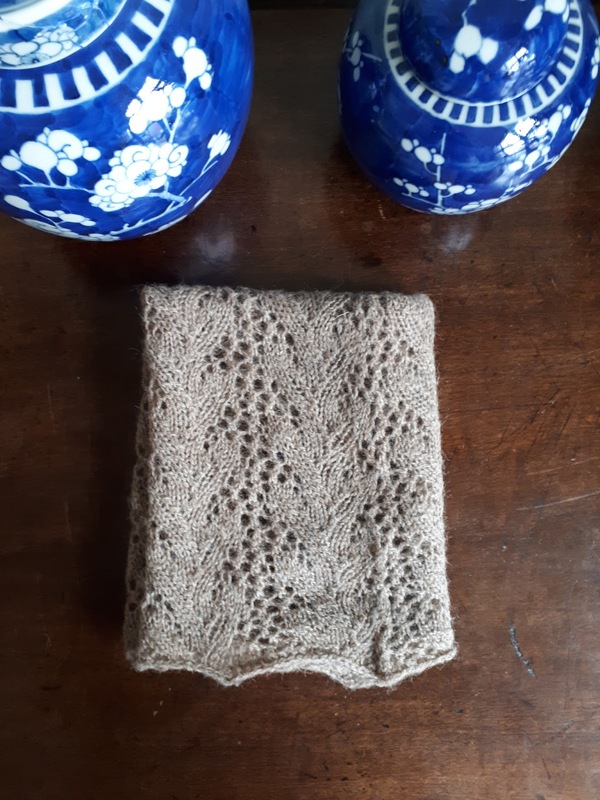 My latest project has been a cowl for a mum, I have a little bit of an obsession with cowls, and working out exactly what the perfect one for my needs might be. This one might just be that cowl. It needs to provide a reasonable amount of warmth, not be to loose, and not be so bulky as to get in the way of mounting a shotgun into my shoulder when I go clay shooting. That's not something you want to get wrong a badly mounted gun recoiling into your collarbone is uncomfortable. I like cowls because they don't fall off, don't trail into things, and easily fit in a pocket when you're not wearing them. 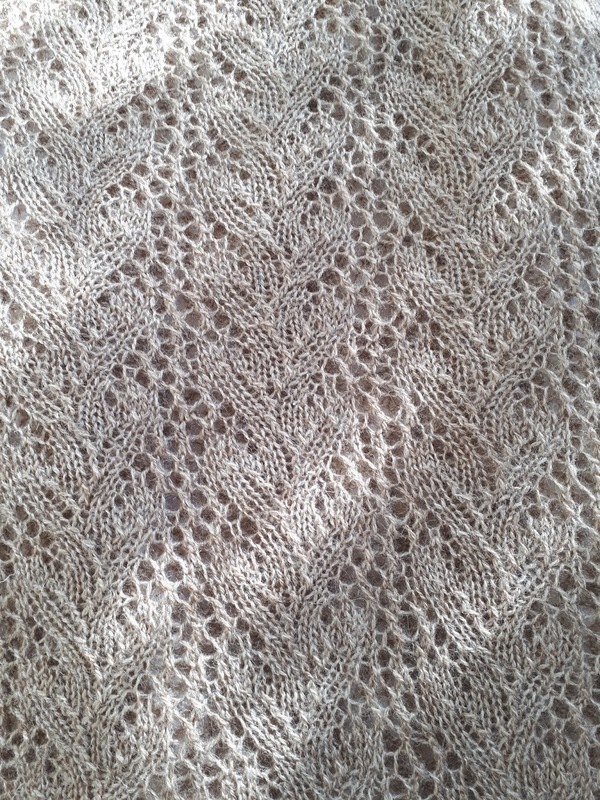 This one is knitted in a traditional lace pattern called print of the wave, in the round on 3.5 mm needles, and used 3 balls of Jamieson and Smith's heritage yarn in natural fawn (which is a shade my mother particularly likes). It's a 17 stitch repeat, that I repeated 9 times (I hope that makes sense). 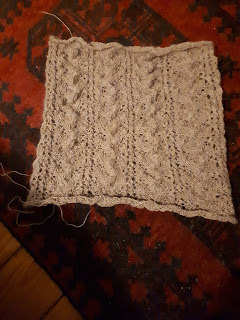 It's not a difficult lace to knit, but it's a little bit more complicated than anything I've done before, and calls for a bit more concentration. Stitch markers were very helpful. 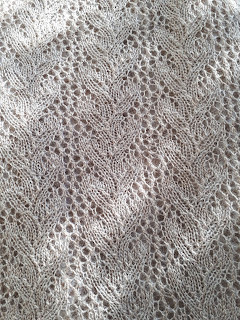 I followed the instructions from Elizabeth Lovick's The Magic of Shetland Lace Knitting, she's admirably clear with written as well as charted directions, so it's the perfect book for any Shetland lace beginner. My sister gave me this (after very heavy hinting) for Christmas, it's a collection of classic tales about animal brides and grooms from around the world which, in what I can only consider an act of optimism, Penguin Classics decided to market as a movie tie in edition with last years live action Disney Beauty and the Beast. Despite thinking that the core audience for the film probably isn't the core audience for the book, I'm grateful that I saw a copy (and very pleased that my sister bought it for me) because without doubt this is my favourite fairy tale in all its many forms, from Cupid and Psyche through to Angela Carter's iterations and everything in between. This collection finds versions from Ancient Rome and Greece, India, Iran, France, Germany, Norway, Italy, England, Russia, Persia, Bolivia, Chile, Colombia, Alaska, the West Indies, Japan, Ghana, the Philippines, South Africa, Myanmar, Ireland, Sweden, Lithuania, and Native American traditions. They explore model couples from ancient times, charismatic couples in popular imagination, animal grooms, and animal brides, and show both how ubiquitous this particular theme is, and how it changes focus and adapts in different cultures and for different circumstances. As Tatar puts it in her introduction "It may be the tale as old as time, but it is never the same old story". It's a welcome addition to my slowly growing collection of fairy tale related books, and worth a look if you share my enthusiasm for them. It's also the sort of book that sends me off down different reading avenues. Right now I'm off to make a cup of something hot whilst I decide if I dig out David Thomson's 'The People of the Sea', or Angela Carter's 'The Bloody Chamber'. Despite it being bitterly cold (I mean serious, chilled to the bone, head straight to the cafe and hug that cup of coffee as hard as you can cold) today was also gloriously sunny and just the sort of day off to venture out and explore something on. 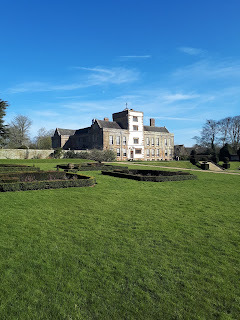 We went to Canons Ashby in Northamptonshire. 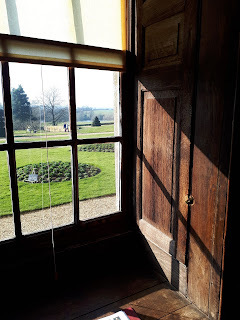 It's National Trust not impossibly far away, and charming. 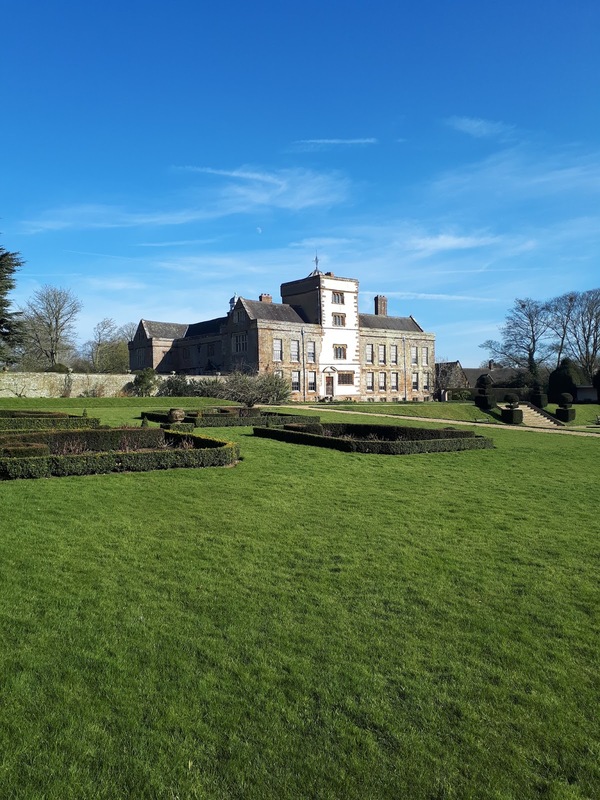 The house has been evolving for centuries, from a medieval farmhouse, to a Tudor Manor House, into a Georgian country house that puts me strongly in mind of Pride and Prejudice's Longbourn, or maybe the Musgroves house in Persuasion. 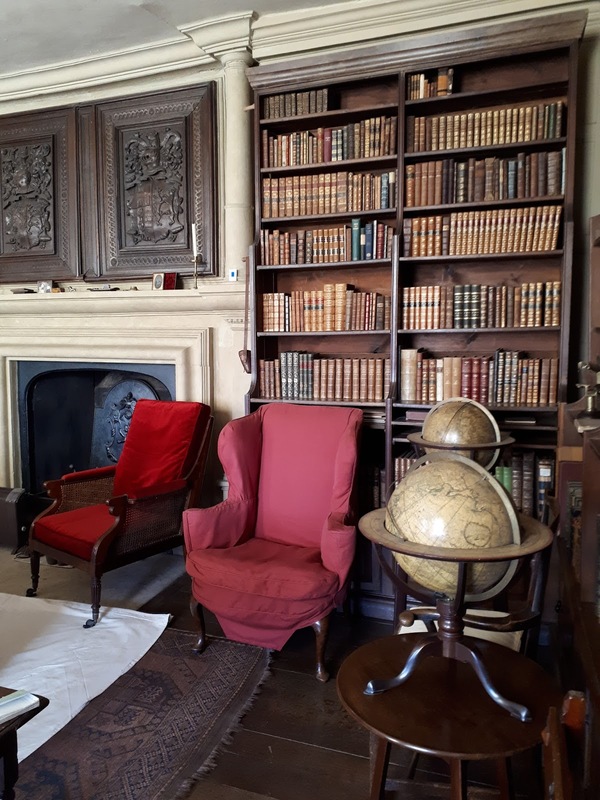 Nothing seems to have been knocked down, rather it's been added to or built over and whilst most of the rooms on public display are large, they're large on a domestic scale. 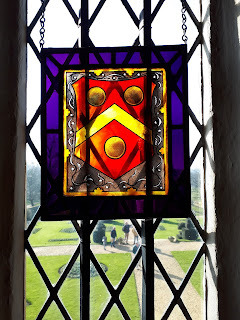 They also have a comfortably battered feel about them - in a way that speaks of age rather than misuse - which adds to the general appeal of the place. The house came to the Trust in the 1980's, apparently in a state of rapidly developing decay, and just in time. 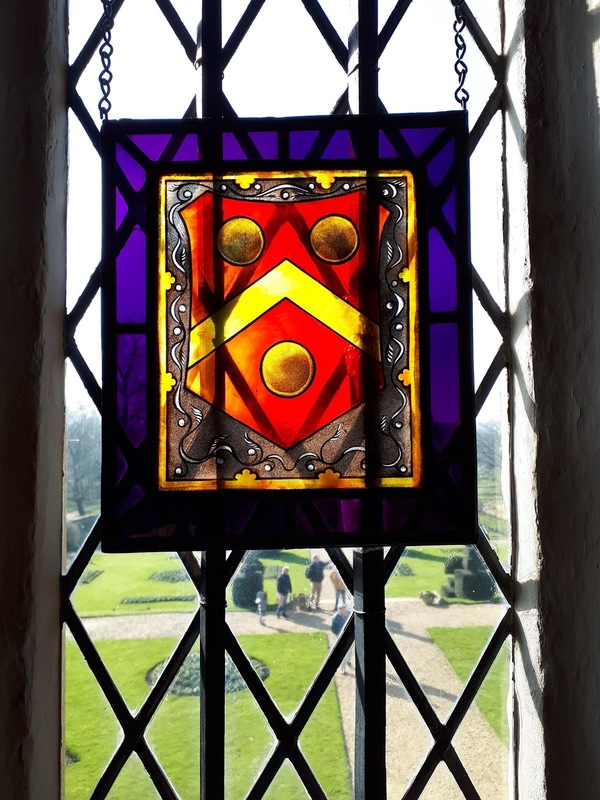 Part of it is still a family flat, and there's a Landmark Trust flat in the tower so you can stay there (which is appealing). It was to cold to really enjoy the gardens today, but they seem to be the most remarkable survival, an early eighteenth century formal layout of the sort that was swept away by the fashion for acres of open grass in the style of Capability Brown. Right now there are snowdrops everywhere, and if it hadn't been so cold (so, so, cold) there would have been pictures of them. 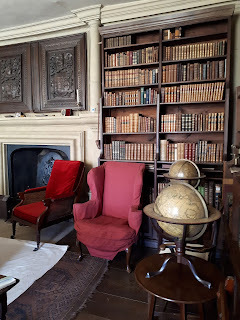 Most National Trust properties seem to house a cobwebby second hand bookshops, mostly filled with the sort of things that high street charity shops would automatically bin, but I got lucky today. 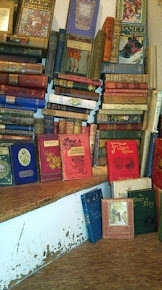 I found a copy of 'His Majesty's Well Beloved' a 1919 Baroness Orczy title, in the curiosity section. It may well be terrible (a lot of words seem to be capitalised which isn't generally an indication of high literary quality), but it might also be fun, and as a Scarlet Pimpernel fan it had to be worth a punt, and the £2.50 price tag. 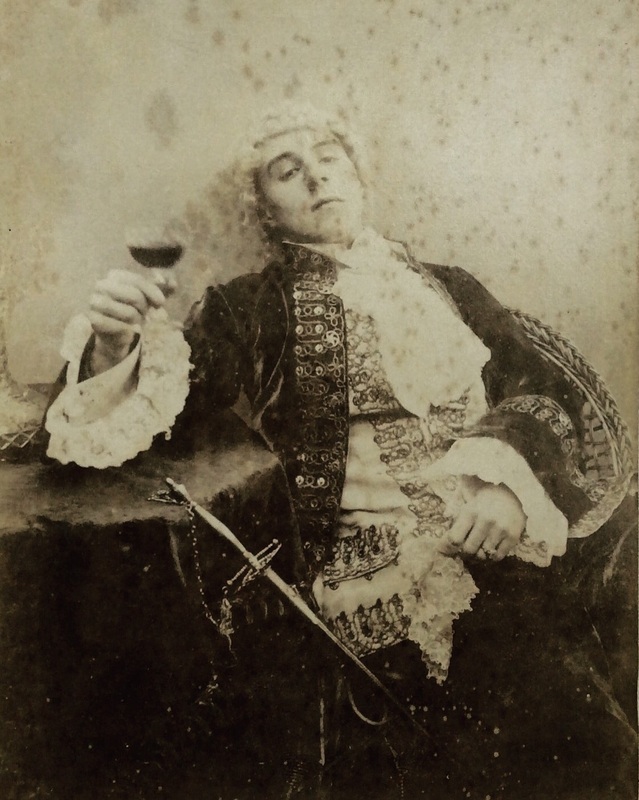 I also found W. M. Thackeray's 'The FitzBoodle Papers', I can't find much about it from a quick search, but it looked promising, and now it's mine. It doesn't really fit with my general intention to eat more salad, but it's ages since I've made, never mind written about, a sweet thing, and I had all the ingredients bar the digestive biscuits (cost 44p) to make the tiffin from Signe Johansen's 'Solo', and it seemed like a good enough plan for a set Sunday evening. I've never been much of a tiffin/refrigerator cake fan, having always found it vaguely disappointing compared to pretty much anything else I might havecwith a cup of coffee. Still, this one called for dried sour cherries and toasted almonds both of which I had left from Christmas baking, and both of which needed using. It was something to do with a packet of shortbread fingers lurking at the back of the cupboard as well, and a whole lot of mini bars of green and blacks chocolate I was given too. Maybe it's the toasted almonds and sour cherries, possibly it's the unorthodox use of an egg (I've been looking at other recipes, they don't seem to use eggs) doing something for the texture, it could be the proper grown up dark chocolate - there's no messing about with cocoa powder here, and I'm not ruling out the influence of the vanilla extract either - but whatever it is - this tiffin is amazing. The tiffin recipe is Here along with one for croque Madame in a Pool article where Johansen talks more about the book. It's my favourite sweet thing since the Sunken Apple Cake from Classic German Baking - and that cake is brilliant. 2018 a year of women? I vaguely remember the debate around Kamila Shamsie's Challenge a couple of years back that 2018 should be a year that the book industry only published female writers. I don't know if it was ever a truly serious suggestion, it was certainly a provocative one, with reasonable condemnation from most quarters. One publisher has taken up the challenge though, And Other Stories are small enough for it to make sense, and to benefit from the publicity. I'm not sure if I'd heard of them before I saw the BBC article (I thought I had, but non of the titles look familiar, so maybe not) but I'm intrigued by what I've read so far - and actually more impressed by the move out of London than the all female list for 2018. I'll be combing through their backlist with interest, as well as being excited to see what they've found for this year. I was less impressed (downright annoyed) by this article in The Guardian and the news that Penguin and Waterstones are teaming up to run a pop up shop in Shoreditch for a couple of days in March which will sell only books by women. Why just Shoreditch? London isn't short of bookshops with the floor space to accommodate all sorts of displays or pop ups to focus on women, the rest of the country isn't so well provided for. My city certainly isn't, we have a very small Waterstones, a Christian bookshop, a branch of The Works, and WH Smith to sell us books. My local university bookshop closed down through lack of use. We do have any number of empty units throughout the town centre which would benefit from some imaginative pop ups. Leicester (the city, rather than the county which has an entirely different demographic) does not do well in quality of life surveys (as This Guardian article also demonstrates). 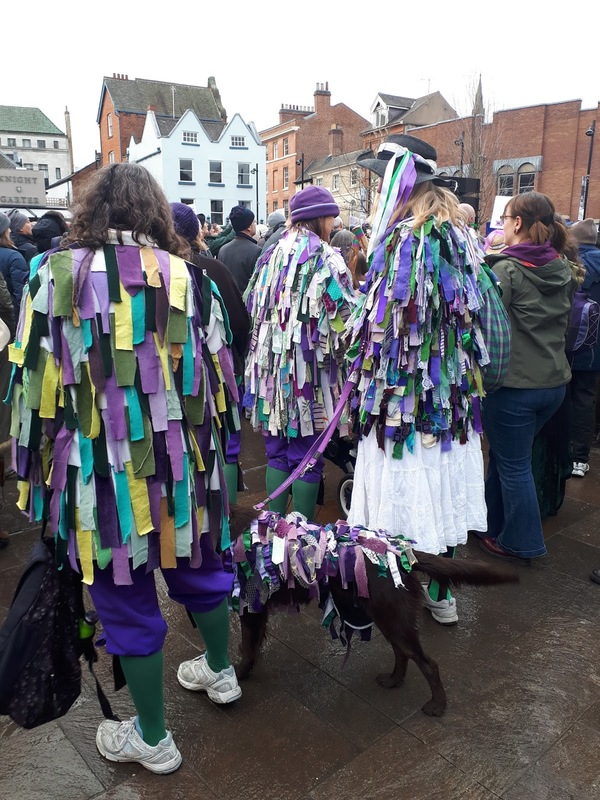 We're not a cultural desert by any stretch of the imagination - this is a fantastically multi-cultural city with an impressive history, and some great things going on, but there's plenty of space for more. We really need to see more of what we can be outside of London. Specifically promoting the brilliant range of women's voices in print deserves a much better effort than a publicity stunt in Shoreditch, and definitely needs a much wider, more diverse audience then this will reach. I had plans for today, they involved me efficiently reading, writing, and knitting. Finishing all sorts of odd jobs, and generally getting stuff done, were high in the agenda. So far I've put some flowers in a vase, consumed most of a packet of biscuits, and done very little else - which is disappointing - although there's also something deliciously self indulgent about basically doing nothing on a week day. By contrast 'the Last Best Friend' offers almost non stop action. Part of the British Library's classic thriller series, I hadn't heard of George Sims before, and probably never would have if he hadn't made it into an edition like this - which says a lot for the power of a book cover. It's 1966, and antiquarian bookseller, Ned Balfour, is enjoying a mid life crisis with a girl half his age in Corsica when he gets a telegram from a good friend back in London saying he needs to speak to him about a terrible decision he has to make. Hours later Sam Weiss is dead, and a stunned Balfour is on his way home determined to make sense of what happened. Initially it looks like Sam's fall from a tenth floor window was suicide, but Sam suffered terribly from vertigo and something doesn't quite add up - including that telegraph. When Ned starts asking questions amongst their friends the answers are inconclusive, until he's warned off by some heavies, at which point it's abundantly clear that something is very wrong. The back blurb tells us that Sam was an art dealer and had survived Dachau, so I don't think it's much of a spoiler to say that nazi art looting is involved, but it unexpectedly chimed with David Williams 'Murder in Advent' in making a reputation a very good reason for murder. A wartime youth is catching up with a whole set of middle aged men in this book. Some, like Sam Weiss, are dealing with what happened to them, others - Balfour - are still coming to terms with how small a part they played, and yet others have different consequences to reconcile. The question is, how far would you go to protect what you have when you have a lot to lose, and what do you go when things start to spiral out of your control. It's a decent page turner that sets interesting moral conundrums for the reader - what to make of Balfour is another one where Sims excels at maintaining a balance between sympathy for his flaws and exasperation with them. The real pleasure of this book for me though was in the details. I love the details of high end luxury in 1966, what it's geography was, something of the moral compass of the times - but then it's always the details that get me. They're the things I relate to; the scent of mimosa, mentions of old German wine (I could almost smell the kerosene note of a good mature reisling) the name dropping of an expensive watch, the street names you recognise, all of those things make a book live in my imagination in another dimension altogether. Way back in the mists of time (February 2014) I decided I would read my way through Zola's Rougon - Maquart cycle. Had I randomly started with 'The Sin of Abbé Mouret', I wouldn't have got very far. I don't know if this is Zola at his worst (I certainly hope it is as I've a long way to go yet) but he's very far from his best here. Abbé Mouret, is Serge, son of François and Marthe Mouret, cousins who's marriage spectacularly unravels in 'The Conquest of Plassans' when Marthe discovers religion and becomes obsessed with her lodger, Abbé Faujas. It ends with the now insane François setting fire to the house. For all its sensationalist elements I loved 'The Conquest of Plassans' having no trouble believing in the mid life religious awakening of Marthe, or the slow degeneration of François, abbé Faujas' machinations, or those of his family. As the tragedy unfolds there's a terrible inevitability about it all. But that's Zola in a relatively urban setting. I knew from 'Earth' that he had a startling view of life in the country, even so he excels himself in 'The Sin of Abbé Mouret'. The village of Les Artaud is a dusty hell hole, inhabitaed by a bunch of incestous, godless, savages. - the whole village is one family, the Artauds, who interbreed in a way that really couldn't be recommended. Serge has something of his mother's religious mania, manifesting itself in an unhealthy adoration of the Virgin Mary. He neglects his physical self to a point where he collapses, at which point his uncle spirits him away to a neglected garden paradise and the care of a young woman, Albine. 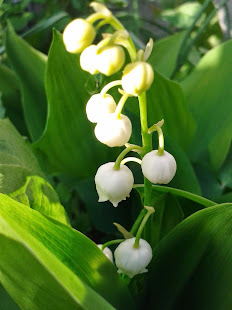 The middle part of the book is Serge, who has amnesia, and Albine, falling in love whilst they explore the garden and their own awakening sexuality. 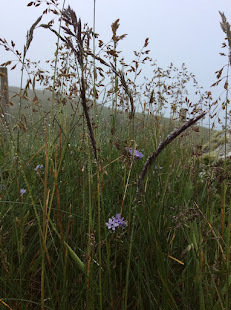 It is by turns long lists of plant life (which might grow as described, but it seems unlikely), and heavy handed metaphors, it reaches a queasy sort of climax with the whole garden 'hot with universal rut'. Discovery quickly follows. By this point I'd well and truly lost patience with it. But it goes on. I get the points Zola is trying to make, and not just because he signposts them in the literary equivalent of 20 foot neon, most of them are points worth making - though the garden descriptions are lazy and heavy going. The kindest thing to say about it is that's it's patchy. Despite all that however I'm glad I've read it, and very glad that it's in a decent critical edition and new translation (by Valerie Minogue). Oxford World's Classics published this last year, before that it had been out of print for a while, at least in English. And at least part of the point of an undertaking to read a cycle of 20 books by the same author is to take the good and bad together. Anyway, I'm glad I've done it, and happy to be done with this one. Here's hoping the next Zola is less heavy going. The cold that was making me so miserable has gone, but as a final hangover it's left me in a bit of a reading slump. I'm struggling to concentrate on anything longer than a newspaper article so at the moment Knitting in front of old films is more appealing than picking up a book. I hope this changes soon, meanwhile I've got some cookbooks to look at which feel like a good half way measure. I bought Solo a couple of weeks ago because it's full of the sort of good I ought to be reading, rather than the food I am eating, and because I don't really enjoy cooking for one. The thing nobody tells you (or maybe they did and I just forgot it) is how young you are when you start to get old. Since hitting my forties a lot of things have changed; I'd never had indigestion before a miserable day last year, now I've had it twice! I react differently to sugar, and to bread, reheated food disagrees with me - everything takes more thought, the days of eating whatever I feel like whenever I feel like it are behind me. My partner has a whole different set of dietary do's and don'ts (auto correct tried to change don'ts to donuts which has a nice irony to it) which also makes things interesting. 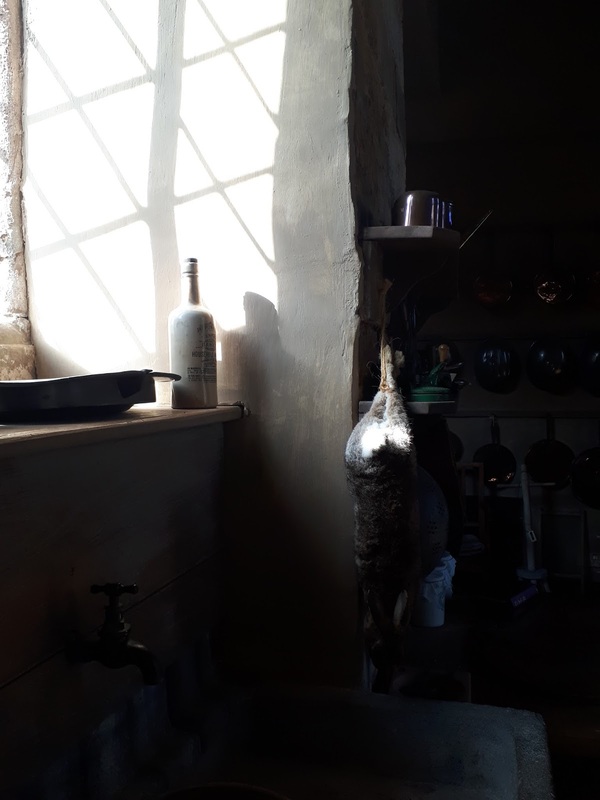 In short, cooking which I've always found a pleasure, has increasingly become a chore when it's just for me, and I'm hoping that some of Johansen's enthusiasm will help me readdress that. 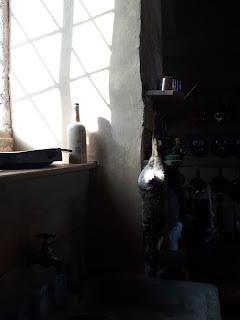 Cooking for others is easier - recipes are so often family sized 4-6 people, or more and sizing down isn't always easy (and there's the pleasure and praise of the people you share the food with to motivate you). It's not just recipes which are family size either, a lot of pre packed meat, fish, and veg, and pre packed is often the only choice you can find, comes in larger sizes than one person needs or wants. The recipe which sold me the book is for Scallops and Sherry. Scallops are expensive, they're also quick to cook. I don't know why I'd not really considered them the perfect treat for one before, but they are. You only need a few, and what nicer thing to cook for yourself, assuming you like scallops as much as I do? The same is true of mussels, I cook them for 2 quite often, but never just for myself, but if I'm getting them from the market getting half a kilo isn't a problem. I'm on the fence about cauliflower, but willing to be convinced that roasting it will change my feelings about it, and so it goes on. There are things I know I'll like here, things I know I will try, and beetroot yoghurt which I won't. The chapters break down into light bites and things on toast, easy weeknight suppers, one pan wonders, make ahead, salad mezze and tapas, simple pleasures, lazy weekends, and sweet things. The flavours are of the bold, clean, fresh kind that I associate with Johansen, but the main appeal of this book is her hope that you'll consider it as a sisterly companion in the kitchen, and thatblike any good sister she encourages you to take care of yourself, reminds you that you're worth the effort, and is reasonable on the subject of buying a tin of soup when you really can't be bothered. It's a perfect book if you're customarily cooking for one, or two, people. Sizing up is much easier than sizing down, if you're cooking for more, and I just really like it's attitude (that's the recipe for crêpes cherry jubilee talking). 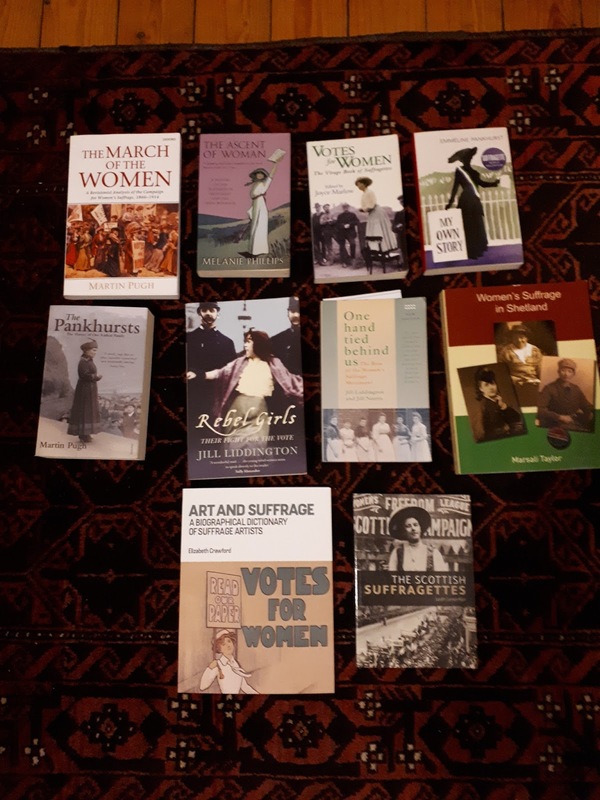 Inspired by Alice Hawkins, and yesterday's centenary anniversary of the 1918 representation of the people act that gave some women the vote I've (literally) dusted off my collection of books on the subject. I have a feeling that Martin Pugh's book about The Pankhursts may have been the first thing I ever bought from Amazon. I haven't read it yet. Elizabeth Crawford's 'Art and Suffrage, A Biographical Dictionary of Suffrage Artists' is brand new, it arrived last week, and is excellent so far. The entries include places you can see the artists work, something I haven't really seen included before, but which is really helpful. The March of the Women might actually have been a university text book, I can't really remember anything about it so I really ought to read it again. 'One Hand Tied Behind Us' by Jill Liddington and Jill Norris was also really good, Liddington's 'Rebel Girls' was a reasonably recent charity shop find (which I got really excited about) and is yet to be read. I haven't read Emmaline Pankhurst's 'My Own Story' either, she's quite a troubling character by contemporary standards and I have a feeling she might be a bit hard to stomach. Still, there's only one way to find out, and I really ought to get to grips with her. I'm actually ashamed of not having read 'Women's Suffrage in Shetland', and intend to put that right directly. 'The Scottish Suffragettes' was a Christmas present and another one I'm looking forward to. The obvious gap in this collection is something that deals specifically with Millicent Garret Fawcett and her circle, which included some remarkable women. When I was reading a lot about this (around about 2004/5, I think it started with wanting to win an argument) there wasn't anything much available. I've been looking at Elizabeth Crawford's 'Enterprising Women' which fits the bill, but would be very pleased if anyone has any other suggestions. I'm also wondering about getting an up to date general history. Some government papers relating to Suffragette history were only released in 2003, after a lot of the books I have were written. I find the arguments that spurred me to start reading in the first place still aren't won, not personally, and not in the much wider argument for equality. There's a lot to be said for going back to the beginning to understand exactly why the fight is so important, to take some comfort from the progress made, and to gain some inspiration from those pioneering, persistent, indomitable, women. 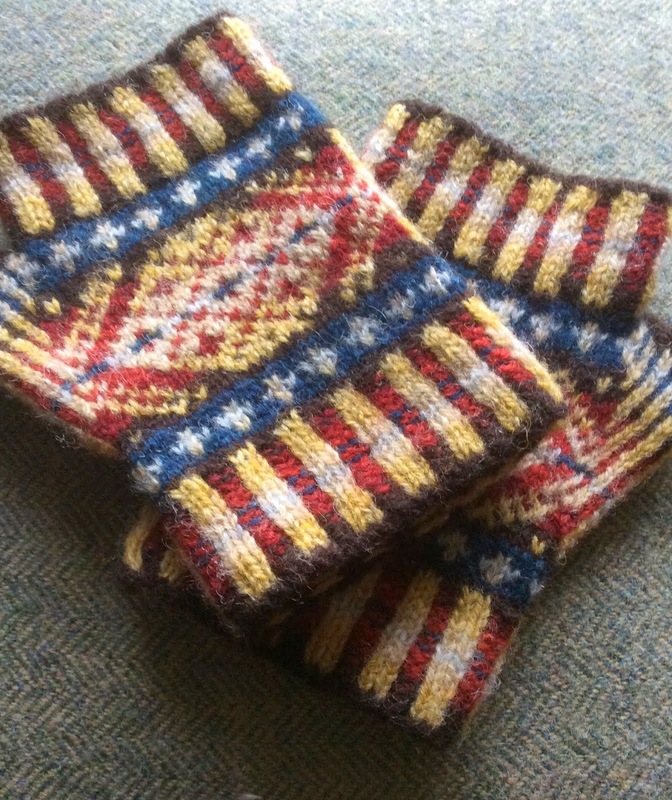 There's a Facebook group devoted to what I'm going to refer to as the official Fair Isle Kep. 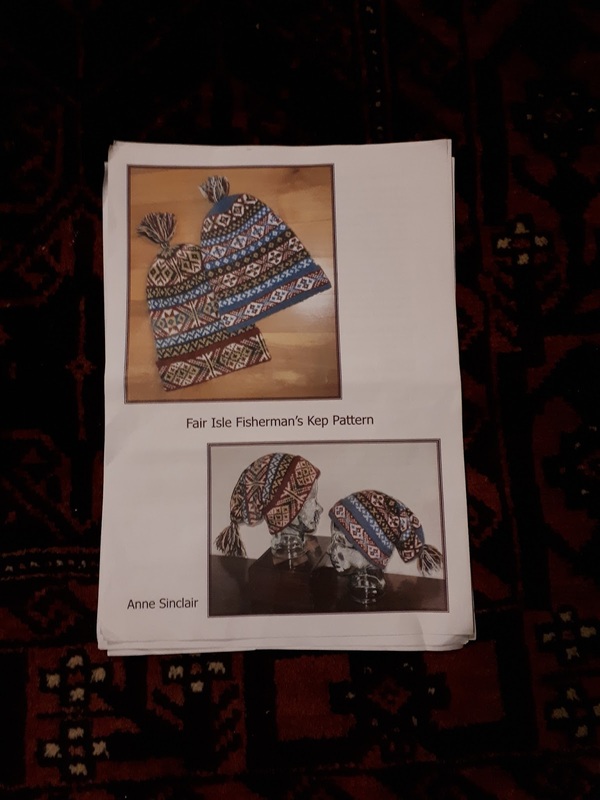 I followed a link to it and immediately fell for the glorious variety of Kep's people were producing, so I joined the group, and bought the pattern created by Anne Sinclair. 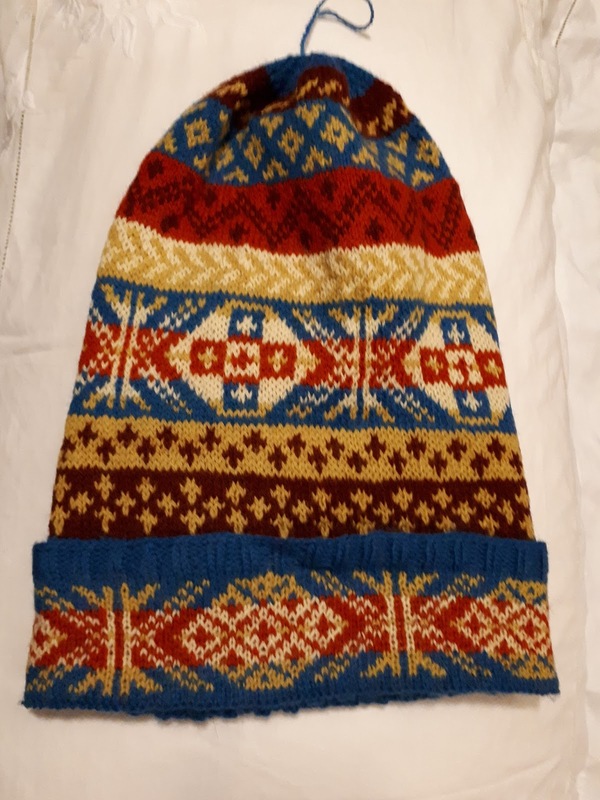 (It costs £10, the money raised goes to fund the local museum, so even if I hadn't knitted it, it would have been money well spent). 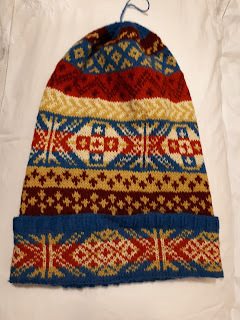 Kep's, for the uninitiated, are a bit like an extra long ski hat, and I guess we're traditionally worn by fishermen looking to keep warm at sea - I've seen old ones in the Shetland Museum, seen pictures of even older ones, and read accounts of them in descriptions of local costume from at last the early 19th century. They are remarkably flamboyant articles. The Facebook group is having a Kep-along at the moment which was just the spur I needed to use up some of my yarn stash and get on with it. The group is friendly, supportive, deeply enthusiastic about all things kep, ranges from beginner knitters to old hands, and has almost 4000 more members than Fair Isle has inhabitants (which I think is about 55, give or take). I do love the thought of thousands of people across the world having this particular link to one small island. Meanwhile knitting the kep was fairly straightforward, I learnt a bit doing it, and realised there's a lot more still to learn - which is all to the good. I used Jamieson and Smiths heritage shades - it's a nice soft yarn, especially for Shetland wool, and as the range is designed to work together I thought I'd be on safe ground colour wise. 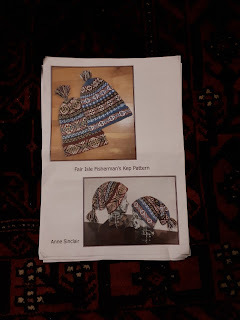 I stuck with the patterns provided by Anne Sinclair (but have seen an amazing array of possibilities in the last few weeks) and avoided adding extra stitches, wanting to keep it as simple as possible first time around. The pattern gives you a basic template to work too, but with all the room you could want for personal variations - which is perfect. I'm quite happy with the results - there are mistakes, but they're not to obvious. How I put colours and patterns together needs more work, but I find it easier to learn from not getting it quite right first time than from careful planning (which I don't always have the patience for). I really enjoyed the community aspect of the knit along and being able to ask questions, or better yet see that someone else had already asked the question. It was also a fun thing to knit. 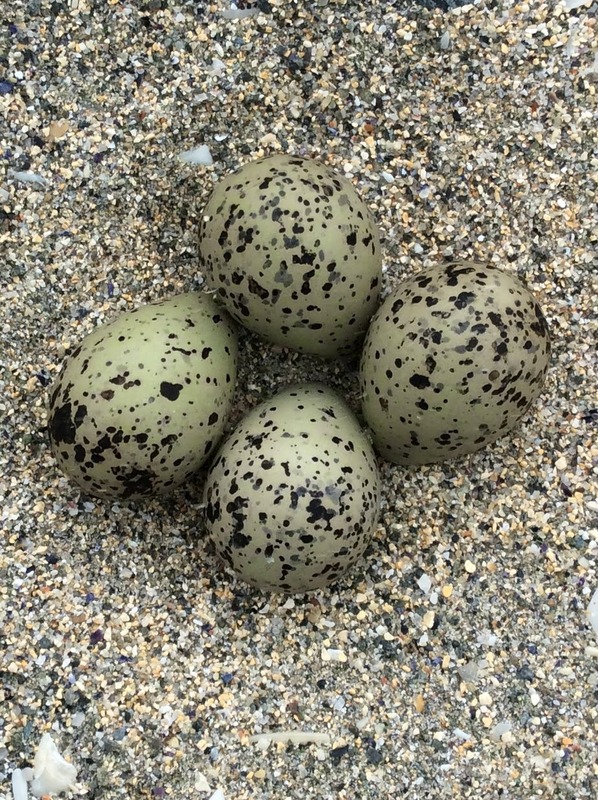 There is a reasonable chance that if you know me, you'll be getting a kep. It's almost exactly a hundred years since some women in the U.K. got the vote, it was 1928 before full suffrage, and however you look at that it's not a long time. 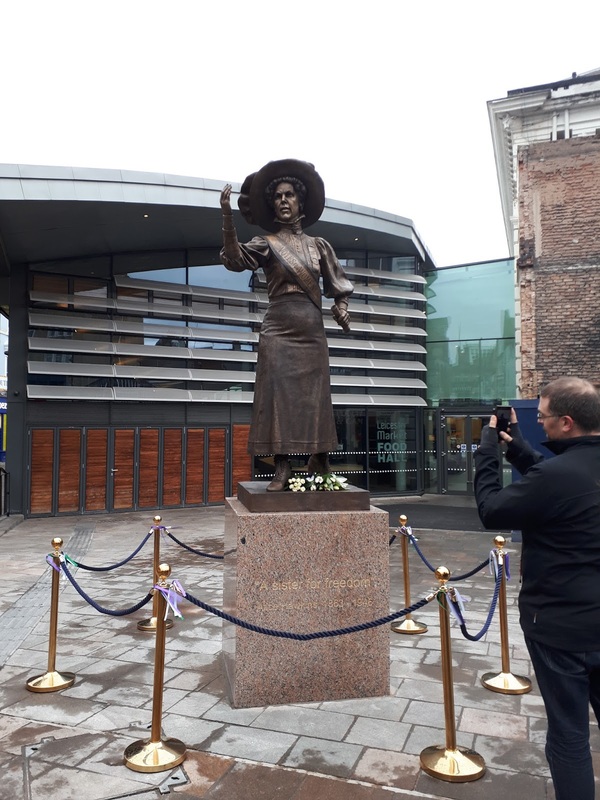 Leicester is one of the cities celebrating the centenary in a big way, and one of 3 (also the first) to unveil public statues. 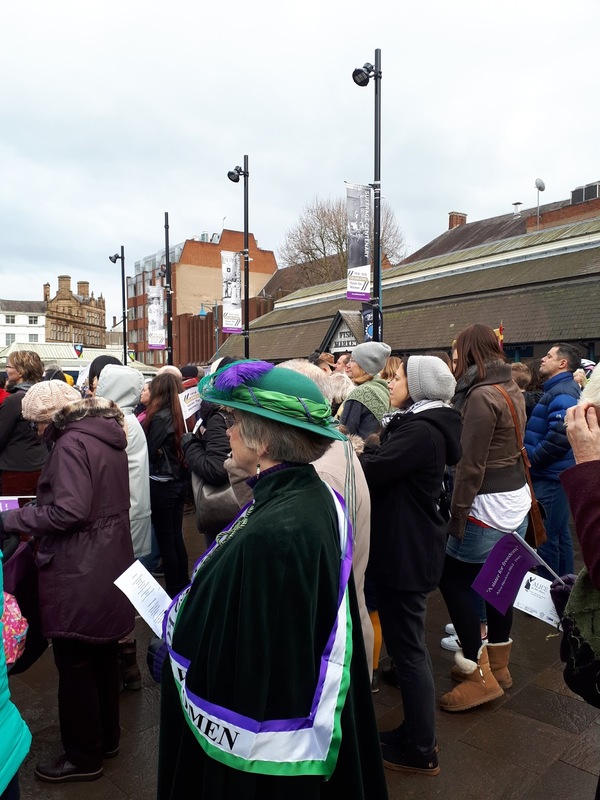 Parliament Square is getting Millicent Garret Fawcett (not before time), Manchester will have Emmaline Pankhurst, but Leicester has Alice Hawkins. She is the first named woman to be represented by a statue in the city (there's a seamstress around the corner, but she's anonymous) and whilst she might not be the best known name in the suffrage movement, she deserves to be better known. Alice was born in Stafford in 1863, a working class girl she left school at 13 and by the time she was in her early 20's was a machinist in the Equity shoe factory in Leicester (the building is a couple of streets away from where I live, as is the street she lived on, and the market place she spoke in). 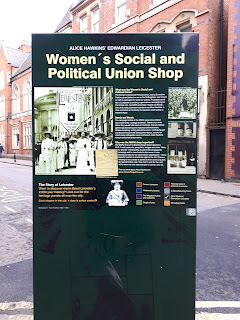 She saw that working conditions and pay for women were inferior to those of their male counterparts, and that the trade union movement wasn't interested in addressing the issue. In 1907 she joined the W.S.P.U, marched in London, and was arrested for the first of five times (another arrest followed carving 'Votes for Women' onto the green of a local golf course). 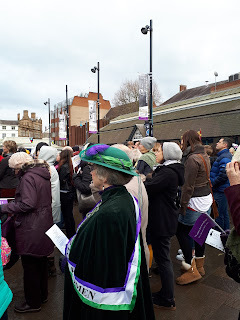 Undaunted she invited Sylvia Pankhurst to speak in Leicester and started speaking on village greens, outside factory gates, and in the market place. That entailed facing down violent heckling and physical assault. After 1918 it seems Alice returned to 'normal' life, dying in 1946 aged 83. She was buried in a paupers grave. I read a lot about the Suffragettes specifically and the women's suffrage movement more generally (the suffragettes have far more written about them than the suffragists do) a few years before I started blogging, so it's high time I brushed up on that history and read some of the newer books. As I recall the Pankhurst's got the lions share of the attention in those books, which I hope has changed somewhat. 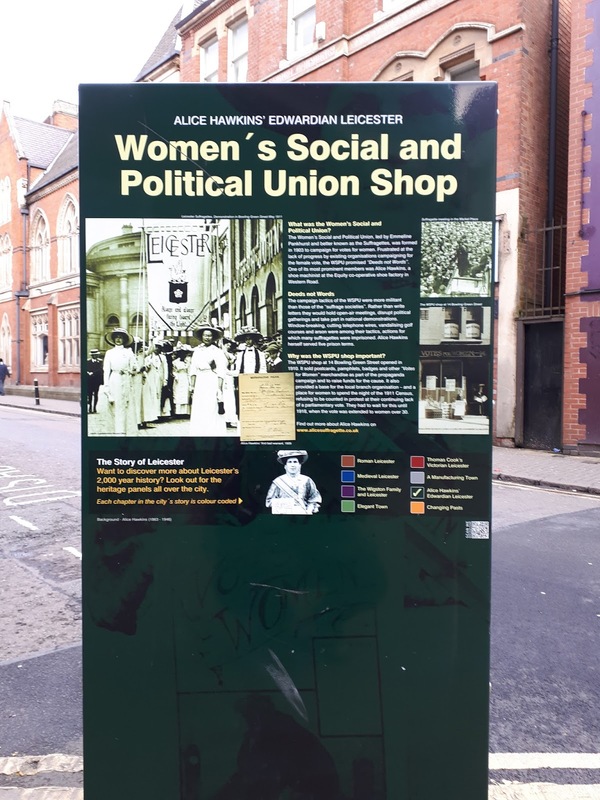 The work they did was important, but the personal sacrifices and risks women like Alice took, women who didn't have the money, education, or influential friends, the Pankhursts did, deserve much more attention. Alice's determination and bravery in standing up for her cause is inspiring - certainly inspiring enough to draw a crowd of several hundred on a freezing February day to see her statue unveiled, and I'm proud that this city has chosen to honour her (and has done for a few years now in various ways, but principly by making her the focus of one trail of interpretive boards around the city centre). It's right that her voice is remembered, because it's precisely such voices which have all to often been forgotten, and their stories are important. I'm still full of whatever cold/flu bug that's been laying me low, and finding it hard to concentrate on reading, so I've been knitting instead. I actually finished 'Murder in Advent' before I went on holiday, but it's taking me just as long to get round to writing about things as it is to finish books (it's just to tempting to sleep instead). I think this one was a stocking filler from Christmas 2016 so it seemed well past time to read it, it was originally published in 1985, which is in line with a few of these Pan reprints. I've had mixed experiences with them, some having been much better than others and initially I wasn't that taken with 'Murder in Advent'. After the confusing bit at the beginning where we get introduced to a lot of people with not very convincing names though it got a lot better. Merchant banker, Mark Treasure (that's where it goes with the names) has been invited to Litchester Cathedral to give the casting vote on if their copy of the Magna Carta should be sold to an American museum. The cathedral desperately needs the money, but the chapter is divided over the sale. Mr Treasure holds an honorary position as a vicar warden which is why he gets the deciding vote. What the reader discovers in the foreword though is that the Magna Carta is almost certainly a fake. Knowing this we're naturally suspicious of all those who oppose the sale, and then when at the 11th hour the library where it's kept catches fire and the Magna Carta is destroyed we're even more suspicious. Unfortunately the Magna Carta isn't the only thing to go in the fire, the Dean's verger is discovered dead, murdered in fact. Mr Treasure starts investigating, and as he does so everything gets murkier. Almost everybody seems to have had the opportunity to murder the verger, and almost anybody might have had a very good motive - it just depends on who knew the charter might have been a fake. In the meantime there's a few other unsavoury goings on that just might be a motive for murde too. The way that suspicion and opportunity is liberally spread around is satisfying too - the guilty party is by no means obvious even as the plot elements come together, and the red herrings are well placed. Altogether the genuine article when it comes to unjustly neglected gems.